which showcases their space paintings and stone creations. Space is infinite. Stars and planets fill the universe, spanning light years away from Earth, making it impossible for us to view all of the cosmic greatness. Lucky for the Chippewa Valley community, one local artist is making it a little easier to see outer space from the comfort of Water Street. Steve Bateman – along with Matt Oliverson – opened a new art gallery, Stone Space Gallery, in early July. Stone Space, 431 Water St., highlights Bateman’s artwork and Oliverson’s stone creations. 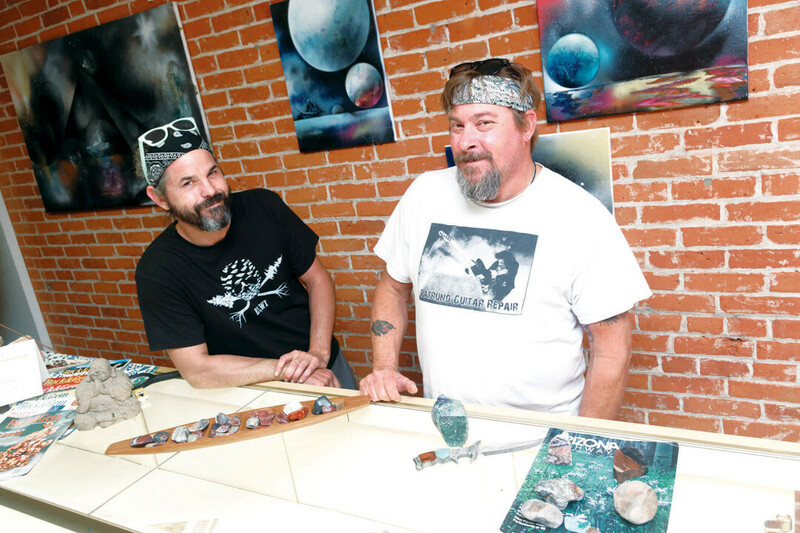 Bateman creates space paintings and Oliverson, a lapidary, polishes stones to create jewelry and other artwork. Together, the duo have created a gallery of vivid colors in a variety of mediums. Bateman is best known for his three-dimensional artwork around Eau Claire, including the famous Garbage Goose sculpture in Banbury Place and the fish made out of Volkswagen Beetle parts on Water Street. Now Bateman is whipping up fresh artwork for the community to admire – and potentially purchase – at Stone Space. “Space painting art doesn’t alienate people, make them feel like they could never do that,” Bateman said. The paintings, created using spray paint, take a matter of minutes to make, he said. The details of the work – usually ghost ships or geometric lines – are drawn with pieces of cardboard while the paint is still wet. After about 10 minutes, the piece is done and ready to hang up in the gallery. Space paintings are a “meditative art,” Bateman said, meaning the time it takes to create them are relaxing and enjoyable. Space is only half of Stone Space Gallery. 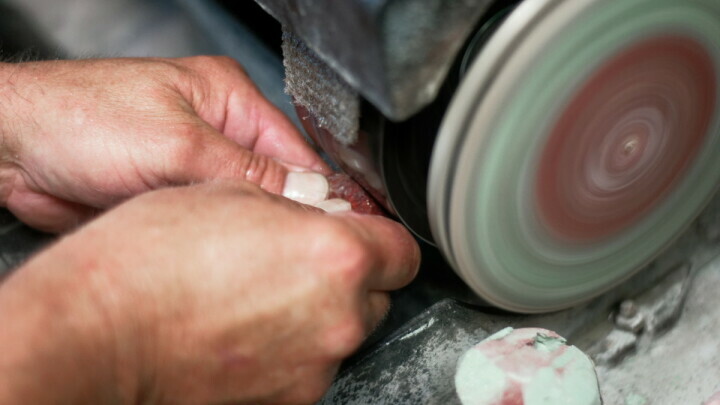 Oliverson polishes rocks and creates jewelry, which is displayed in a glass case inside the gallery. Oliverson has been working with stones for about 25 years, but has been fascinated with rocks since his eighth-grade geology class. This gallery is exciting, Oliverson said, and they hope to have the local community come out to support and learn during the duo’s ventures. Bateman and Oliverson have known each other for three years. Oliverson helped Bateman create a banjo sculpture featured at June’s Blue Ox Music Festival just outside Eau Claire. With the assistance of Dan Turner of Artisan Forge, the sculpture stands 25 feet tall on the festival grounds. The bulk of Eau Claire’s art galleries are located around South Barstow Street, but Bateman deemed the area “pretty full,” and decided Water Street would be the perfect location for the gallery. They’re hoping to steer Water Street away from its notorious bar stereotype. Outside the gallery is Bateman’s first “found objects” sculpture, “The Guardian,” which he made two decades ago while in college. Right now, the gallery is mostly filled with Bateman’s space paintings, but he plans to bring in other smaller pieces and sculptures, he said. Bateman wants to hold classes to show people how he makes his space art. Oliverson is interested in doing some lapidary classes as well and even taking “field trips” to find rocks to polish for attendees. Ultimately, Bateman hopes the gallery brings people and artists together. He will use the gallery to host monthly art shows, he said, where he’ll connect local artists with out-of-town ones to introduce the community to new art. Oliverson and Bateman are planning a grand opening shindig for Aug. 17. The event will consist of live music, lights, and, of course, a surplus of artwork. Oliverson will also be doing demonstrations to show his polishing process. Stone Space gallery is located at 431 Water St. The grand opening celebration is set for 3-11pm Aug. 17. Official hours will be posted after the grand opening. Learn more at facebook.com/stonespacegallery. Stone Space Gallery is a new art space from Matt Oliverson and Steve Bateman, located at 431 Water Street. The gallery, which offers unique stones and paintings, had a soft opening on Tuesday, July 3.